La-La Land Records proudly announces its forthcoming release of Star Trek: The Original Series Soundtrack Collection, a limited edition 15-CD box set, showcasing all episode scores as heard in all three original seasons of the landmark sci-fi television series Star Trek(1966-1969). This special collection of ground-breaking, iconic music, from one of television’s most acclaimed and beloved series, has been newly remastered from studio elements and features hours of stellar material previously unreleased in any format. Limited edition set to only 6000 units, this special set will be released on Dec. 4, 2012 at www.lalalandrecords.com at 1pm (PST). The retail price will be $224.98. Original series composers Alexander Courage, George Duning, Jerry Fielding, Gerald Fried, Sol Kaplan, Samuel Matlovsky, Joseph Mullendore and Fred Steiner are all represented in this deluxe collection, their historic work meticulously assembled, restored and remastered to ensure the finest presentation and sound quality possible. 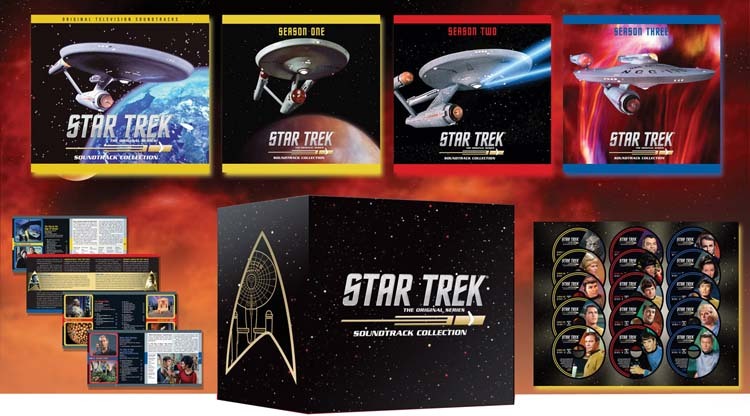 Four CD booklets, totaling over 100 pages and featuring exclusive, in-depth liner notes from film music writer and Star Trek historian Jeff Bond, complement this attractive set, which is housed in a hardcover slipcase. Star Trek: The Original Series Soundtrack Collection is licensed by CBS Consumer Products and produced in cooperation with GNP Crescendo Records, the longtime home of pioneering classic Star Trek television and film soundtracks. GNP Crescendo’s Neil Norman has allowed for episode scores previously and exclusively released by Crescendo to be newly expanded and remastered for this box set, in order to make the collection as comprehensive as possible.